Between all the service branches there is a friendly rivalry that will always create jokes among the various branches. The Coast Guard often gets its share of jokes starting with the fact that the Coast Guard was formerly part of the Department of Transportation (now Homeland Security) and not the Department of Defense. Other DoD branches obviously charge forward with "not even in the military" but the Coast Guard has definitely seen its share of life and death operations on the high seas, dealing with drug dealers, and even being deployed in the War on Terror overseas to handle port security and other coastal threats. However, we all make fun of the Coast Guard. Here is a long list of "You Might Be a Coastie if...."
4. You precede every public speech with, "I was going to tell a sea story, but seeing the lack of Cutterman's pins out there, you all just wouldn't understand"
13. While underway, a life raft comes loose, hits you on the head and you're counseled for "loss of situational awareness"
14. Members of other branches of the service visit your work space and they shout, "Wow, I haven't seen one of these in 20 years!" 15. Your idea of aromatherapy is Simple Green and JP5. 16. ...Any time you set out on a trip you expect to hear "make preparations for getting underway". 17. When you come home with groceries you shout, "All hands lay to the garage/driveway/curb for stores". 18. You catch yourself speaking to your children in the same tone of voice you use with your non-rates ... or is it the other way around? 19. You are not sure if there really is life out there, i.e. in the real world. 20. It seems every time you watch a movie it says on the bottom of the screen "Property of the US Navy"
21. If you've had people say to you, "The Coast Guard is military?" 22. You might be a TC Coastie if everyone on the ship asked you what you do in the radio room and then got mad because you said, "I could tell you but then I'd have to kill you!" 23. If getting to sleep after mid-watch was ever difficult due to the ever-present sun up above throwing your system off. 26. You've woken up in the "red zone" in Panama. 27. WMEC means 'We Must Eat Chicken' to you. 28. If your 40-year-old boat is getting underway on Monday for a 6-week patrol and your still making plans for the weekend because you know the boat will break down within 2-3 days. 29. You might be a Coastie if your ship sends an emergency CASREPfor the broken coffee maker. 30. You might be a Coastie if the Marines get upset when they see you get to use real bullets in your weapon. 31. If your child refers to the boat or station as "where Daddy lives"
32. You claim to have a woman in every port, yet you are at an ashore unit. 33. 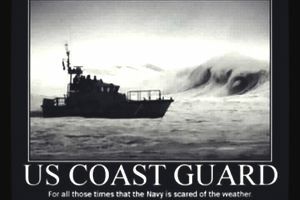 You run from the kitchen, trip over the dog, fall and hit your head on the coffee table just to see a 15 second blip on TV when you hear the words "Coast Guard"! 34. You PANIC when you have to wear nice civilian clothes out because you can't color coordinate because you know no other than blue. 35. Your wife looks at you strange and spouts out, "You're not my Chief, and I sure as hell ain't one of your damn Seaman!" 36. If you abbreviate words so much that you for get how to spell them out. 38. If you believe USCG really stands for "Uncle Sams Confused Group"
Thanks Coast Guard for what you do.